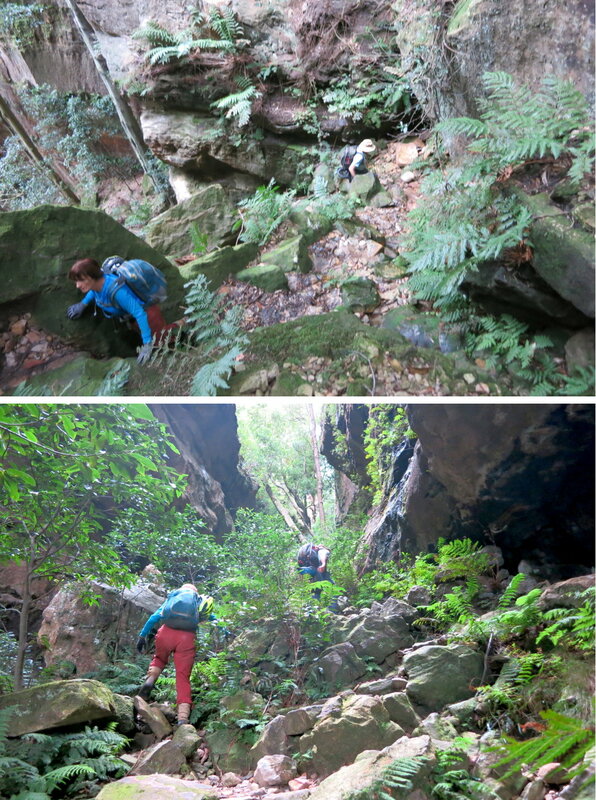 Two months ago, after we explored Bleichert Ropeway, we went pass the entrance of Rennies Tunnel on the Federal Pass Walking Track. A peek inside the tunnel had Freda announcing with excitement that we should spend a day to explore it. Ah, she is a lady with a young and adventurous heart ! So, Today the 3 of us, Nick, Freda and I, are here. 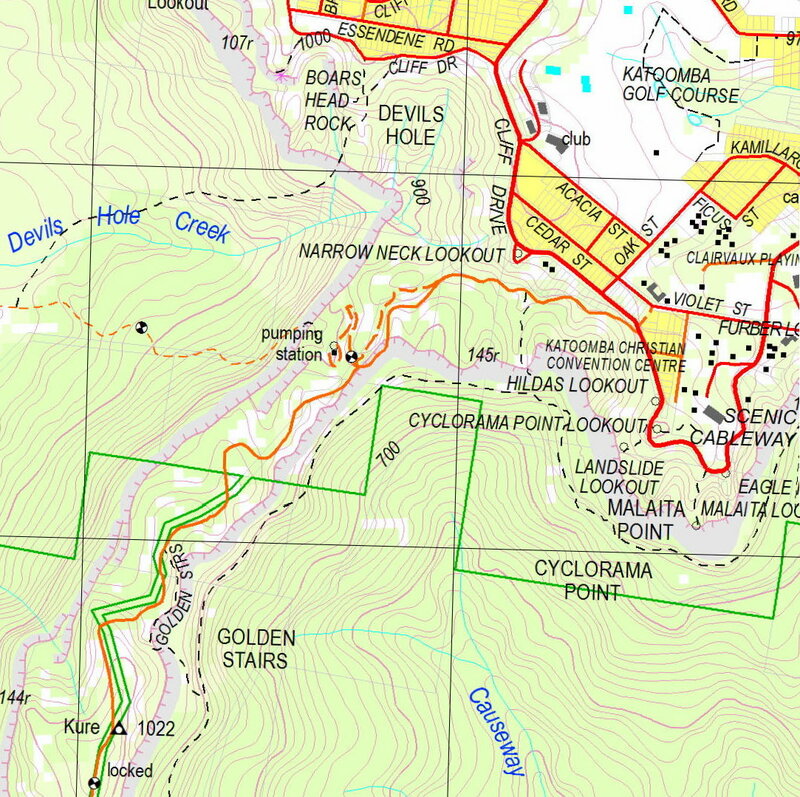 Below is a historical mining map of the Katoomba / Narrow Neck area. 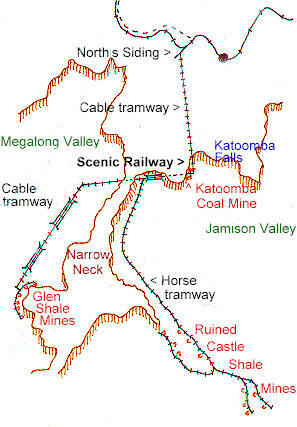 Rennies Tunnel (or Mt Rennie Tunnel) is the part of the horizontal tramway line in the middle of the pic, that runs under the Narrow Neck plateau, connecting Jamison Valley with Megalong Valley. 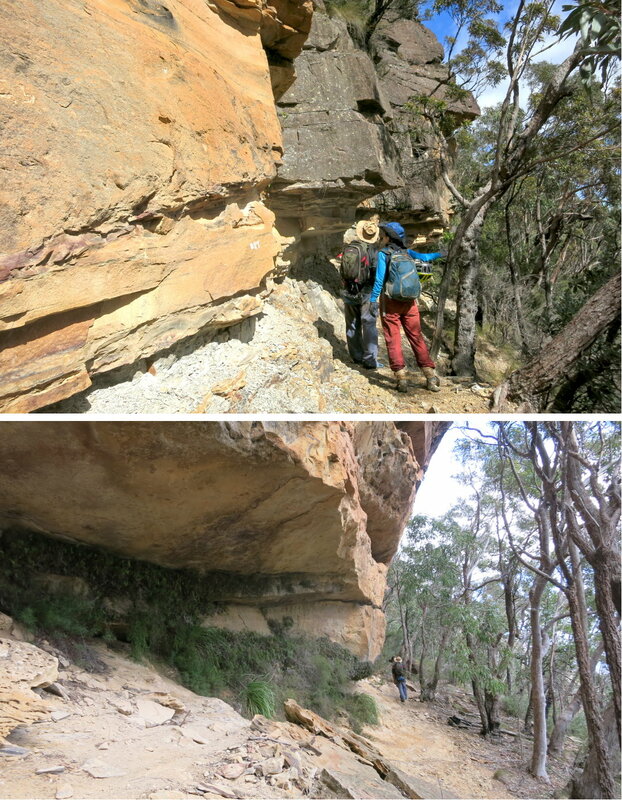 It was built in the early history of Australia to transport oil shale from Glen Shale Mines to the Blue Mountains railway via the then cable haulage facility, the Katoomba Incline. The tramways are now gone, but the tunnel is still there. The tunnel is 400 meters long. For most of its length, it is 3.5 meters wide and 1.2 meters high, just wide enough for a double track tramway, but not high enough for us to stand up. 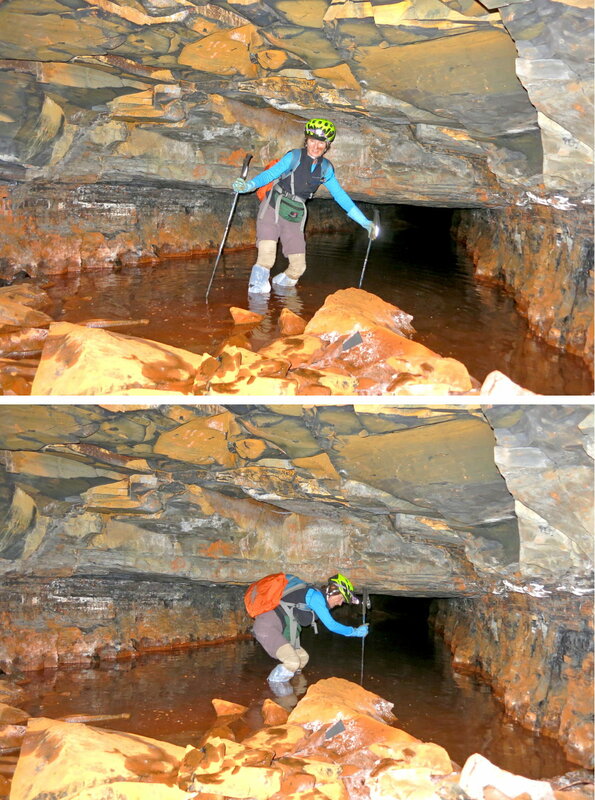 The bottom of the tunnel is ochre mud/slime, messy & unpleasant ! 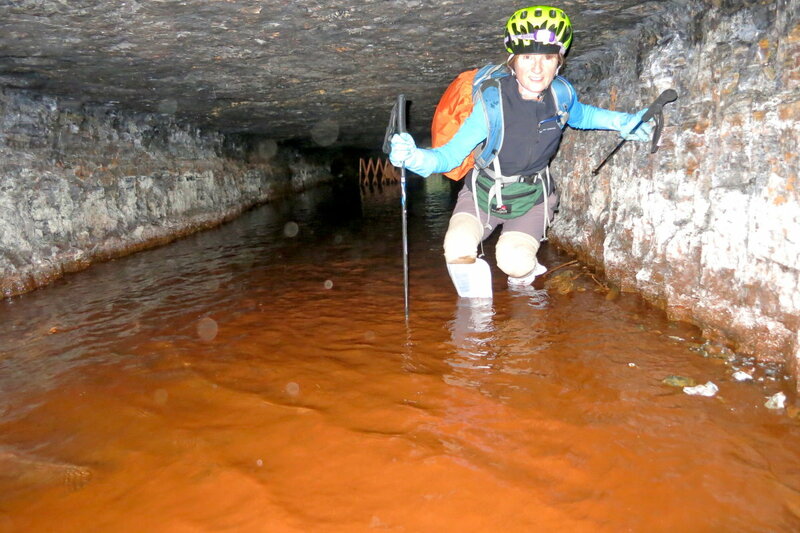 The water and mud stain everything that your wear into orange/brown. The stain can't be washed away. If you intend to go through the tunnel, be prepared to throw away everything that you had worn. The tunnel is home to a colony of small bats. But we can't find any when we are there. 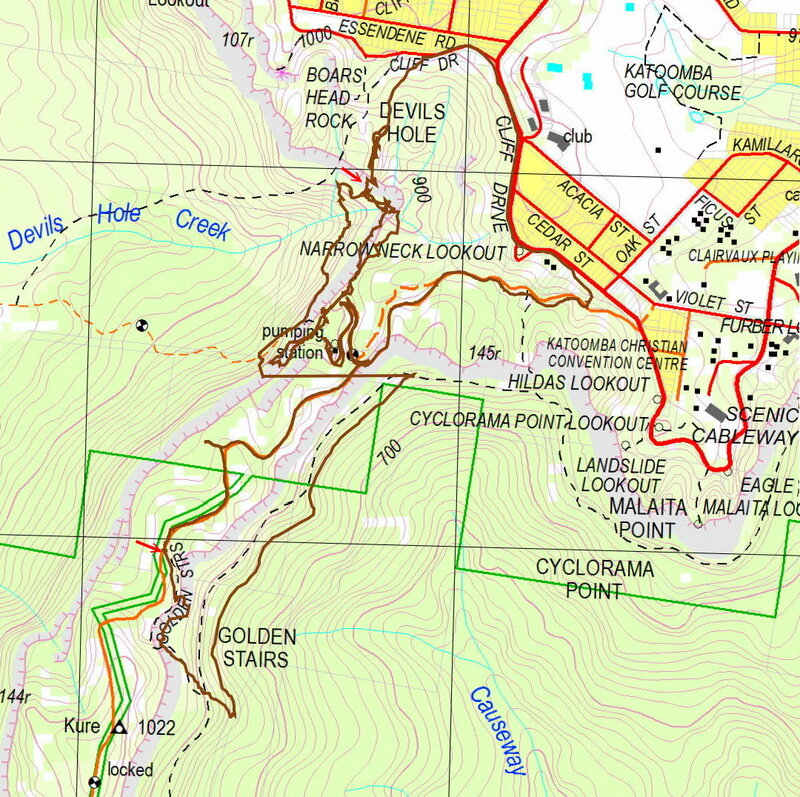 Here is the 1:25,000 scale map of the Narrow Neck, Devils Hole & Golden Stairs area. Here is our tracklog (brown colour) in the 1:25,000 map. 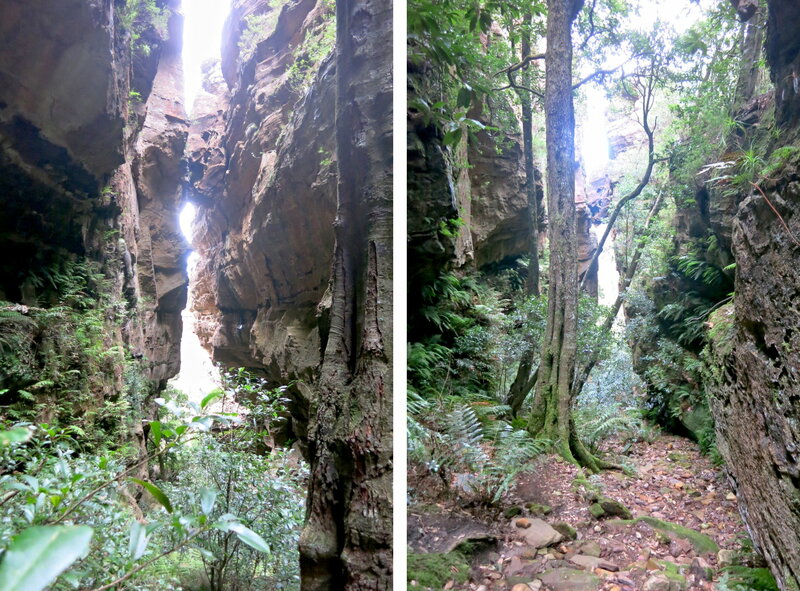 • The upper red arrow points to Devils Hole pass through which we climb up towards Cliff Drive in Katoomba (Photos #34, #35 & #36). 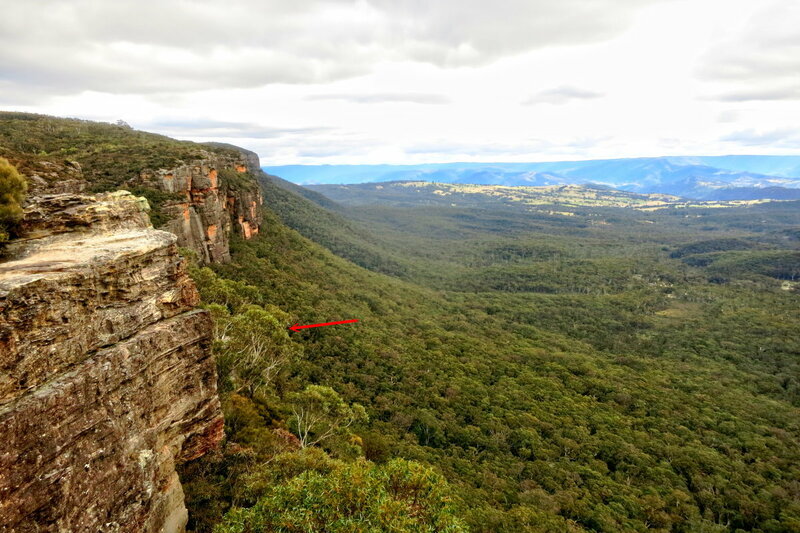 • The lower red arrow points to where we park our car, at top of Golden Stairs, on Narrow Neck plateau. - The horizontal straight line in brown in the middle of the pic is Rennies Tunnel. 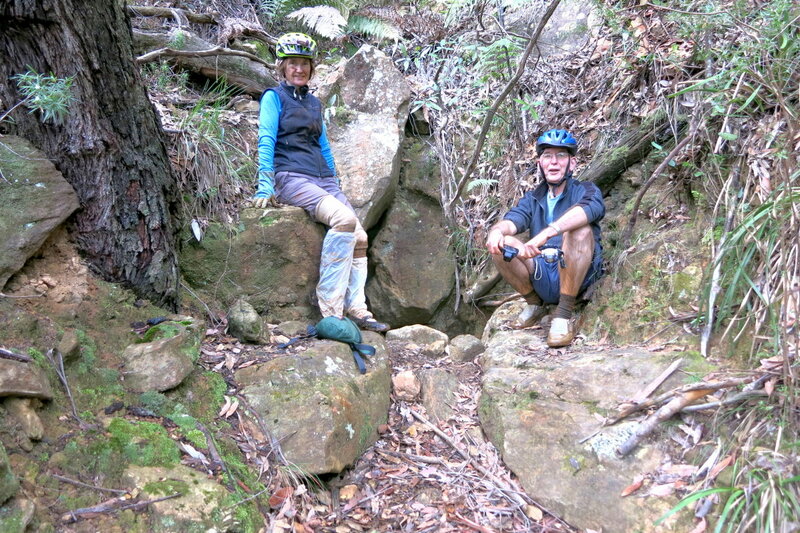 Our entry to the tunnel is on the right side, on the Federal Pass Walking Track. - Park car at the top of Golden Stairs on Glenraphael Drive (lower red arrow of the above map). 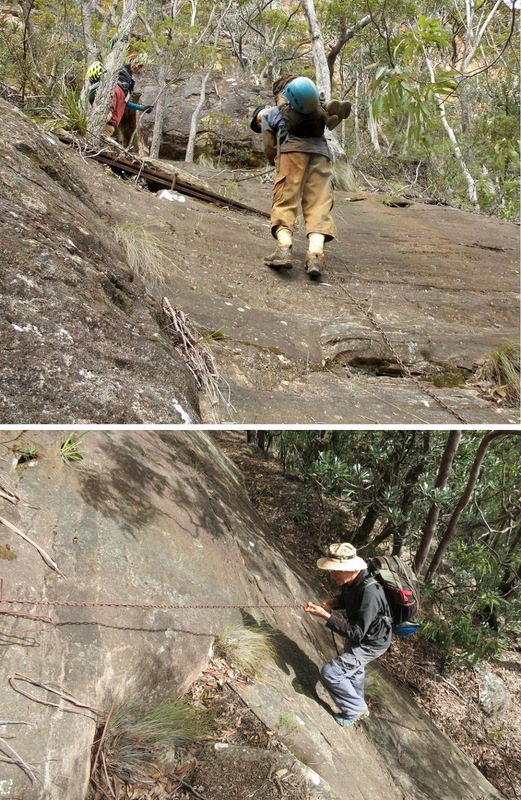 - Walk on Federal Pass Walking Track to entrance of Rennies Tunnel. 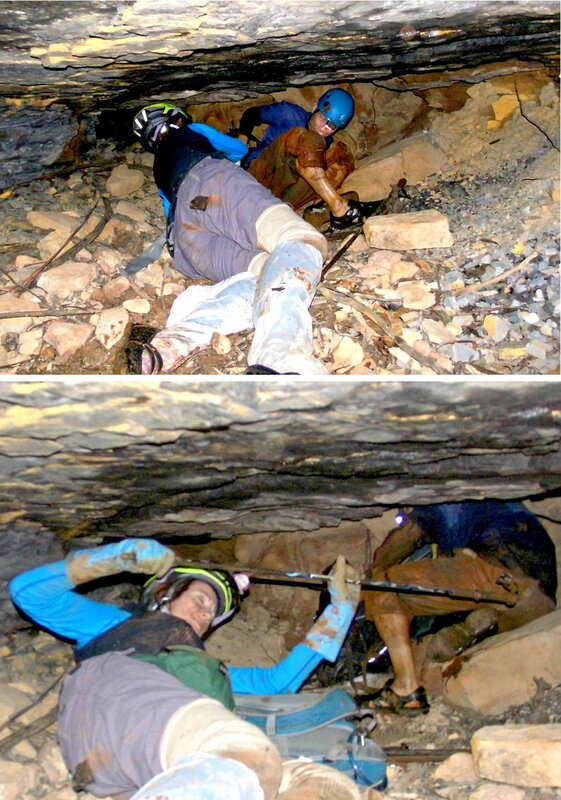 - Crawl through the Tunnel to Devils Hole side. 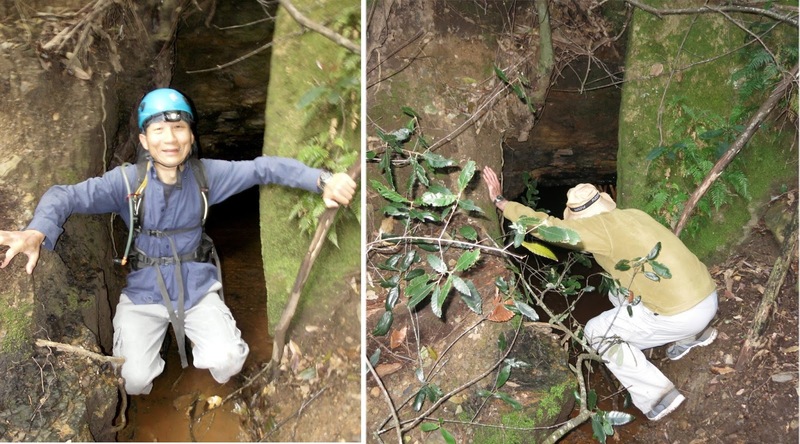 - Explore the Devils Hole area. - Turn into Glenraphael Drive and back to our car. - You can just make out the outline of the Three Sisters (red arrow). 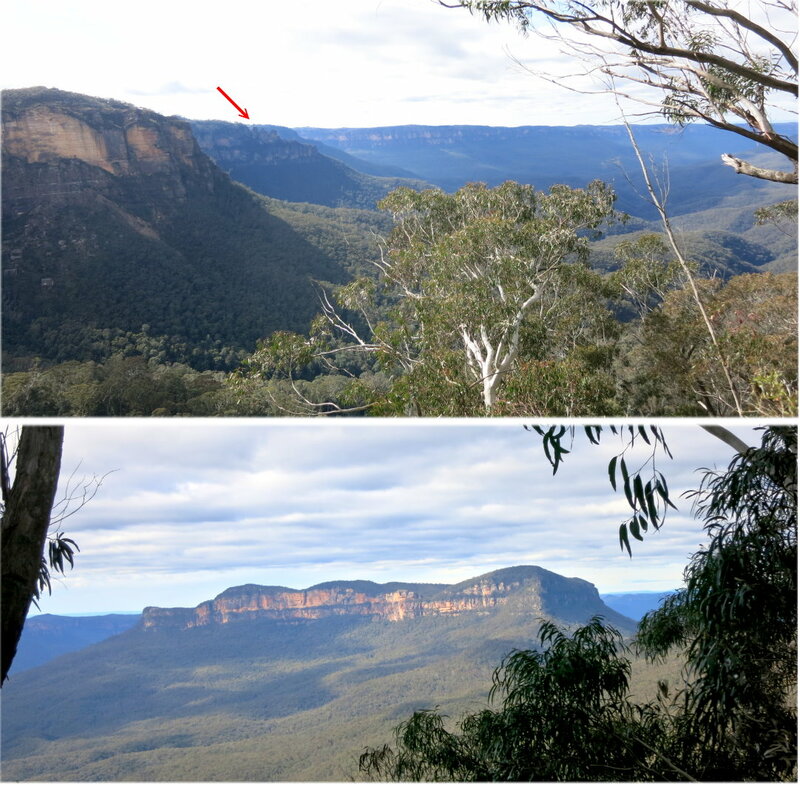 - Mt Solitary is in the (lower photo). Its name was from the early history of Australia, by way of a Salvation Army officer who would walk down the stairway to hold services for the shale miners in the Jamison Valley. 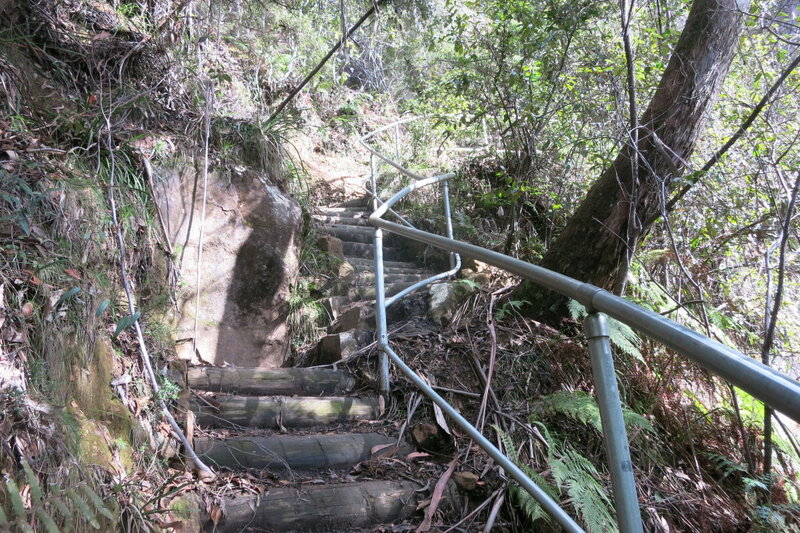 On the way back up, the officer would sing Emma Booth's song, "O I'm climbing up the Golden Stairs to Glory." 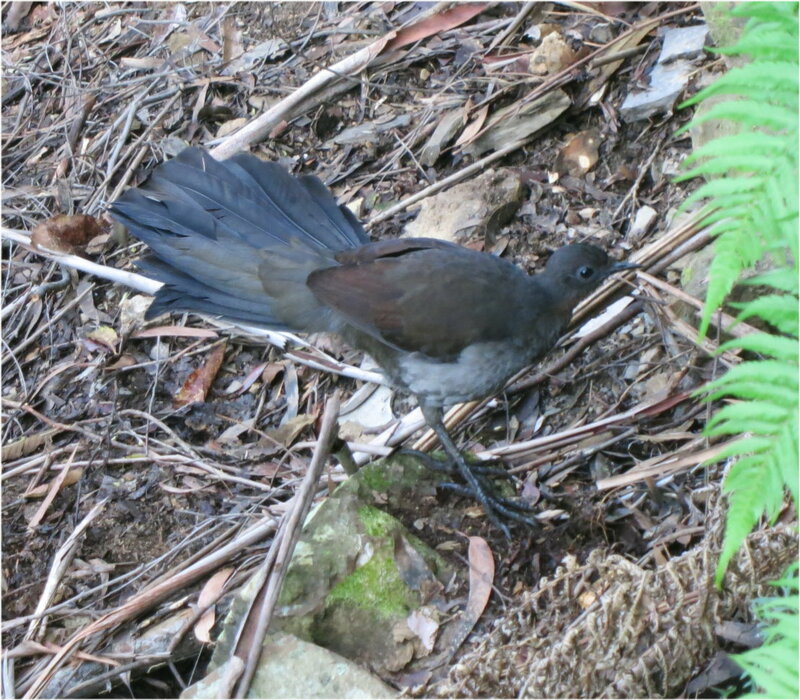 5) A Lyrebird by the side of the Golden Stairs foot track. We are now on Federal Pass Walking Track, right in front of the entrance to Rennies Tunnel. Freda wraps plastic bags around her legs. 8) Just inside the tunnel is a gate. The gate is not shut. 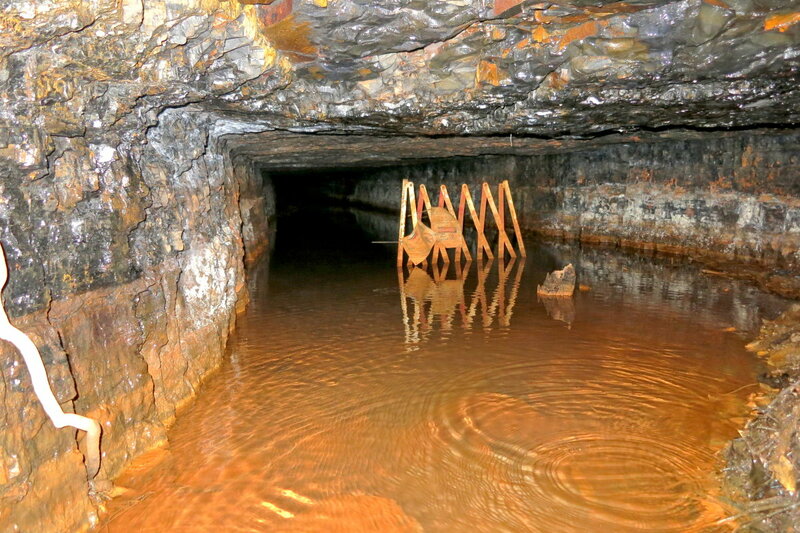 But it has a sign - "Danger, Do Not Enter" - all the more reason why we are going in to explore ! The water is a above ankle high, up to the shin. 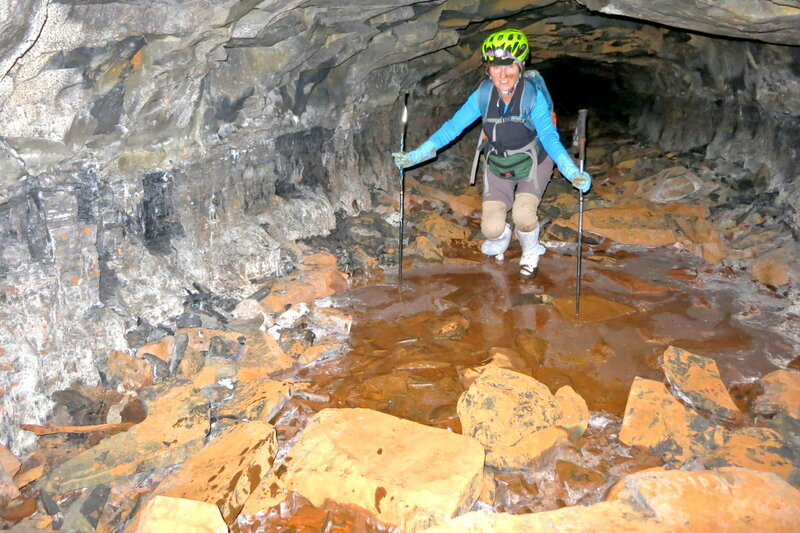 The bottom of the tunnel is ochre mud/slime, messy & unpleasant ! Instead of crawling like me, she uses the hiking poles instead. The ceiling of the tunnel is slightly higher here. But still, not high enough to allow one to stand upright. 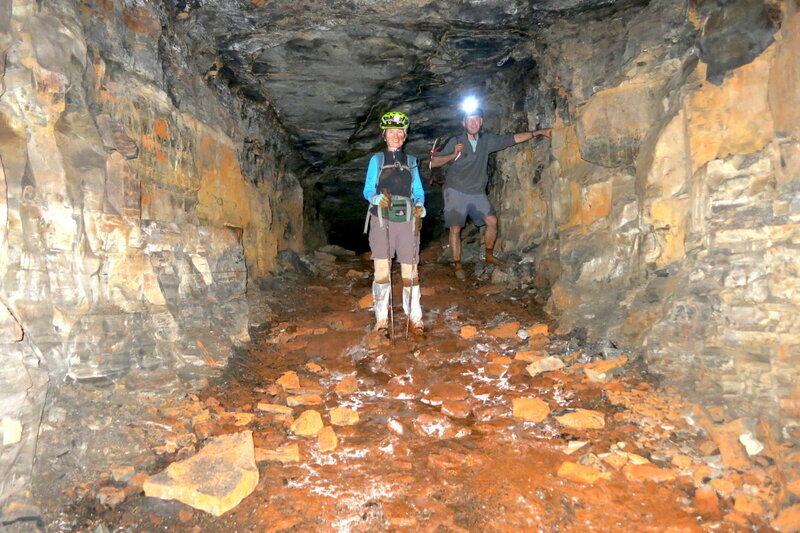 14) We are about to enter another stretch of the Tunnel with a much lower ceiling. - I wear croc shoes. This is a mistake as the water is icy cold. 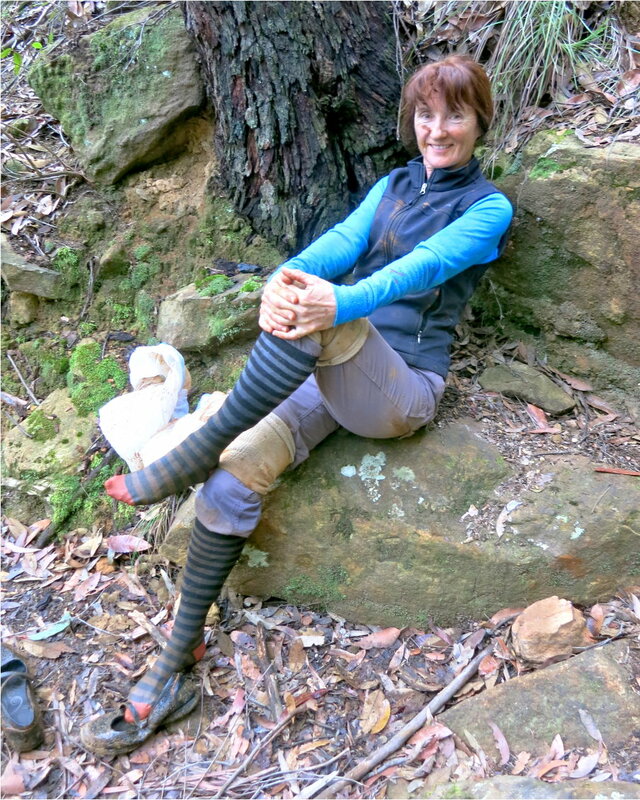 Far better is to wear shoes and socks which should keep the feet warmer. - If you intend to crawl ... which was what I do, then wear a pair of knee pads. They are really helpful. 17) ... But at the point of exit, we need to lie down to slide through. 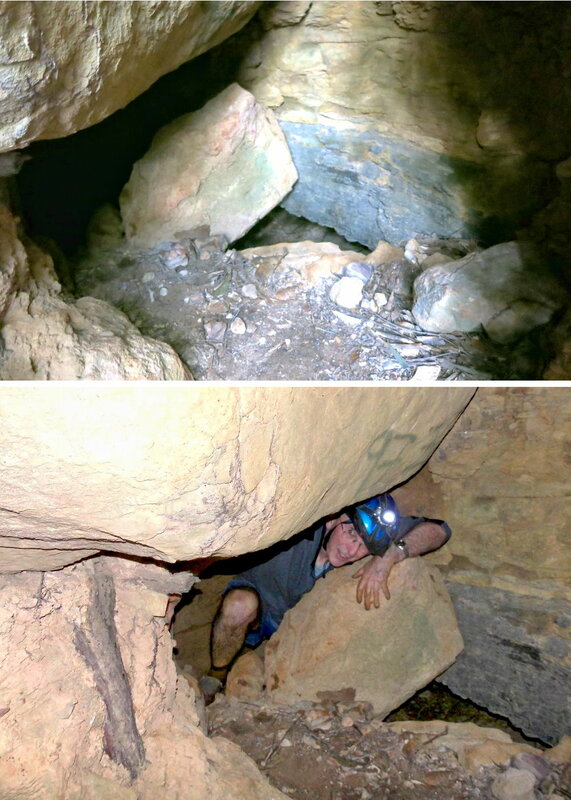 - Does anyone know whether the rock at the centre of the photos is due to a natural rock fall or purposely dumped there to prevent people from entering the tunnel ? 19) The red arrows point to the slit where we squeezed out of the exit hole. 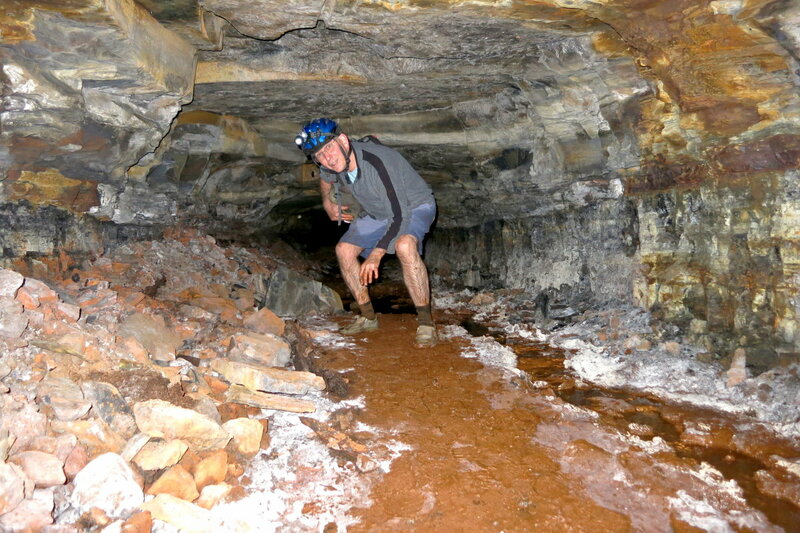 My pants were light grey before entering the tunnel (see Photo #6). Now it is stained brown. The stain will stay on forever and can't be washed away. 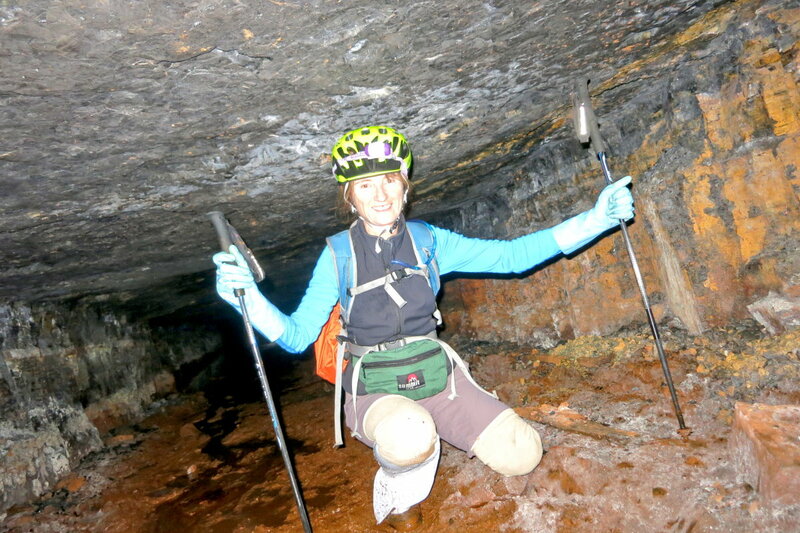 Compared with me, she is very clean ... she used hiking poles to crouch-walk through the tunnel ... smart woman ! 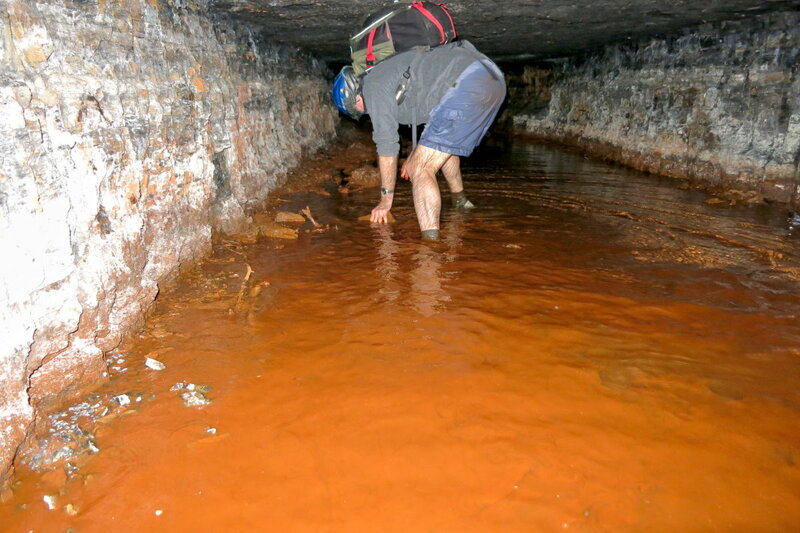 24) As for me, once through the tunnel is enough ... not keen to crawl through it again ... because the yukky orange water and mud stain everything that I wear, including my toes ... I have orange toe nails for a few days afterwards ! 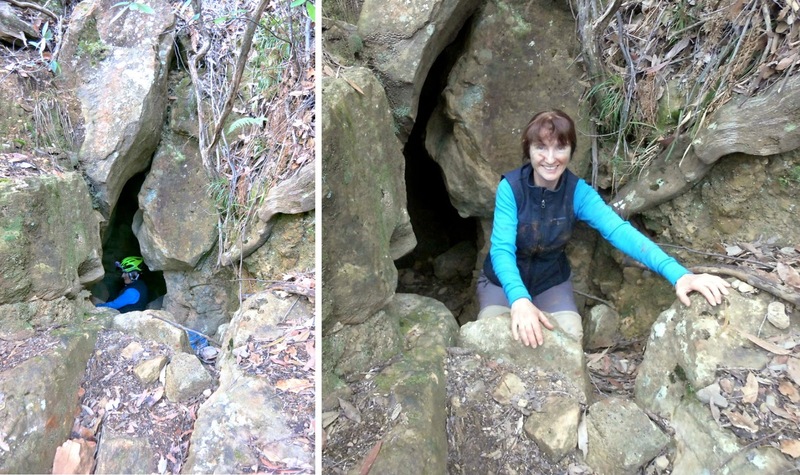 25) After the Tunnel, we explore nearby areas around Devils Hole. 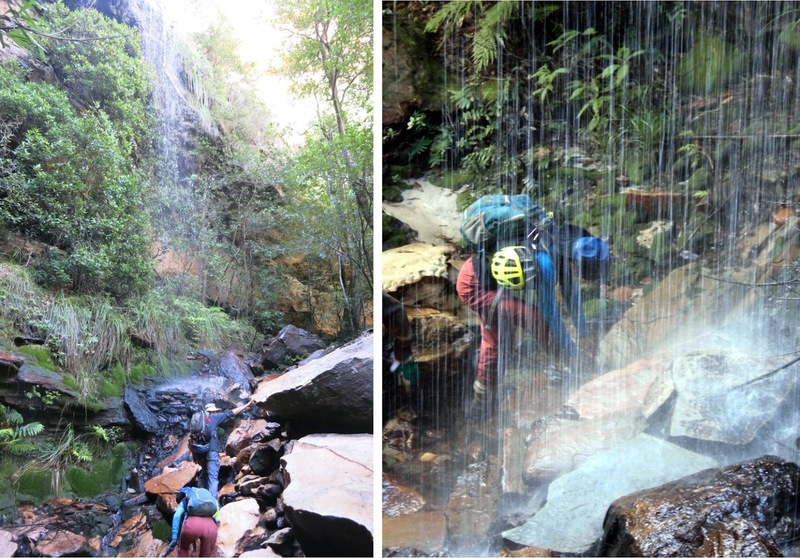 Here we are at a waterfall where the Devils Hole Creek tumbles down the cliff. 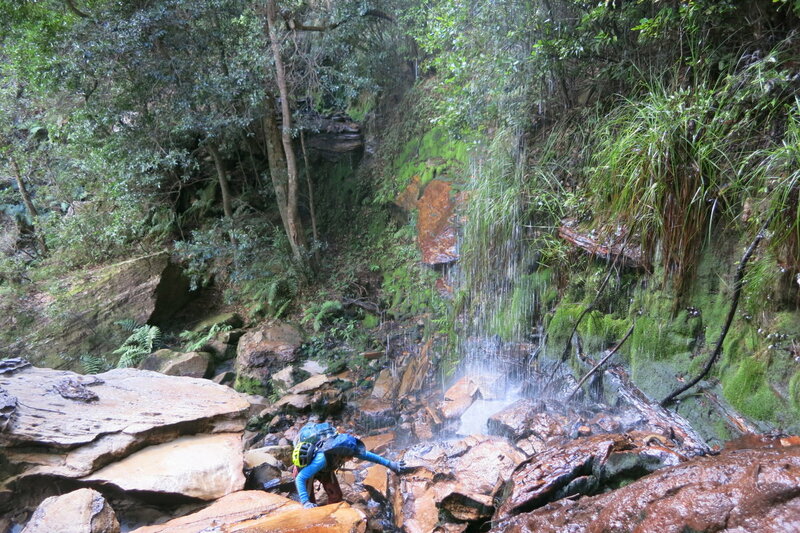 After the waterfall, we return to where we crawled out of Rennies Tunnel not too long ago. 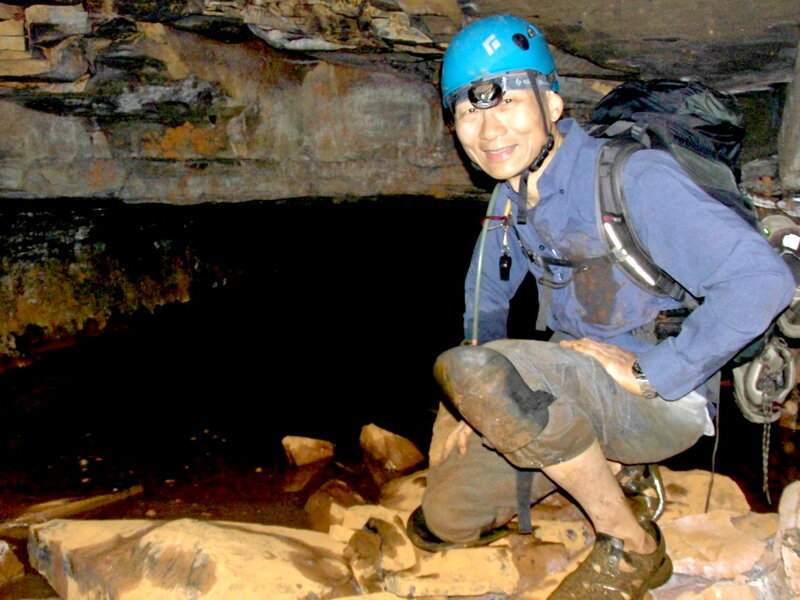 The return route is higher on the slope then when we leave the Tunnel to go to the waterfall. 29) We come to the Waterboard's ladder, called Dixons ladder. 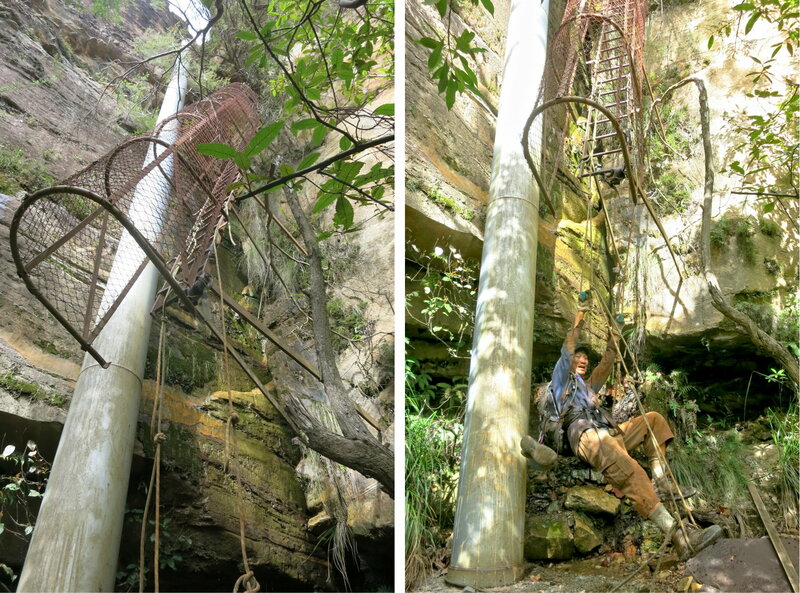 In the past, if one climbs up the ladder, one will reach the Waterboard's Pumping Station at the top of the cliff on the Narrow Neck Plateau. However, both the bottom rungs and the top half of the ladder have been removed; though some kind souls have strung up a rope to help you up. We don't intend to climb up the ladder, though we all make an attempt for the camera. One day, I like to come here again and climb up the ladder. 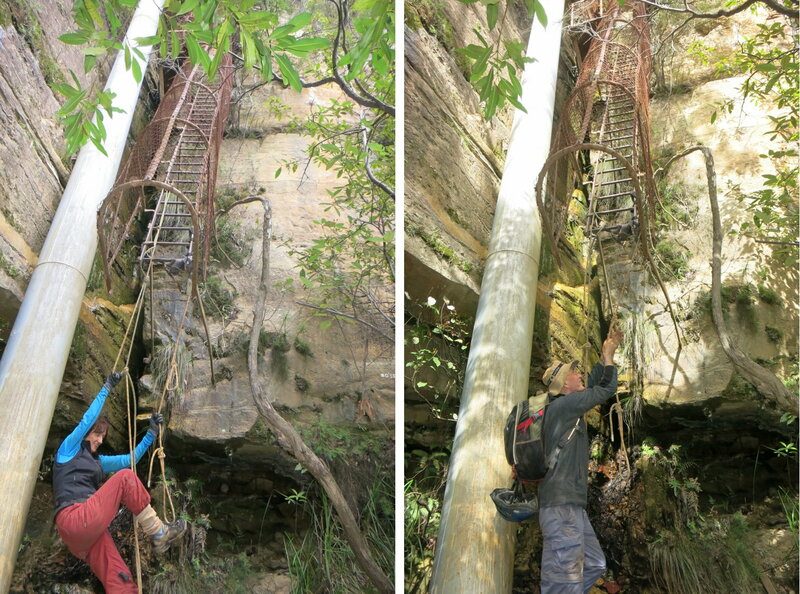 At where the top half of the ladder was removed, there is a ledge in the middle of the cliff. 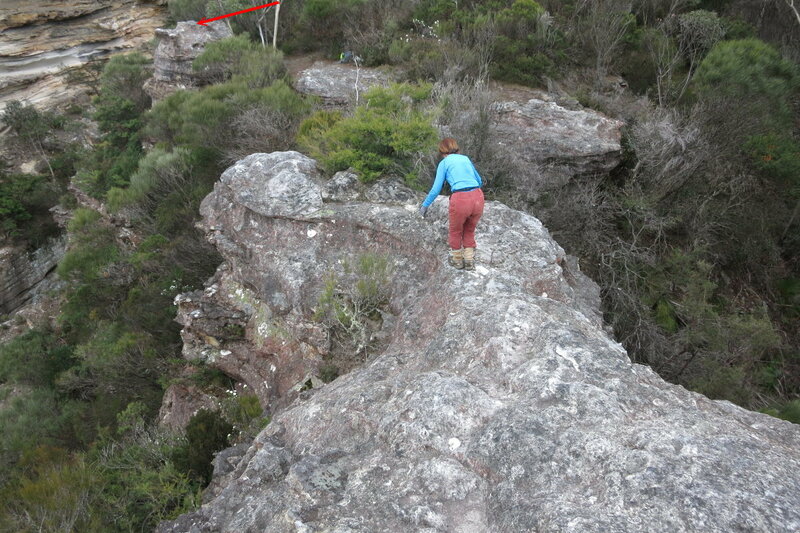 I think one can inch along the ledge towards the north and it will lead to the Devils Hole waterfall area. 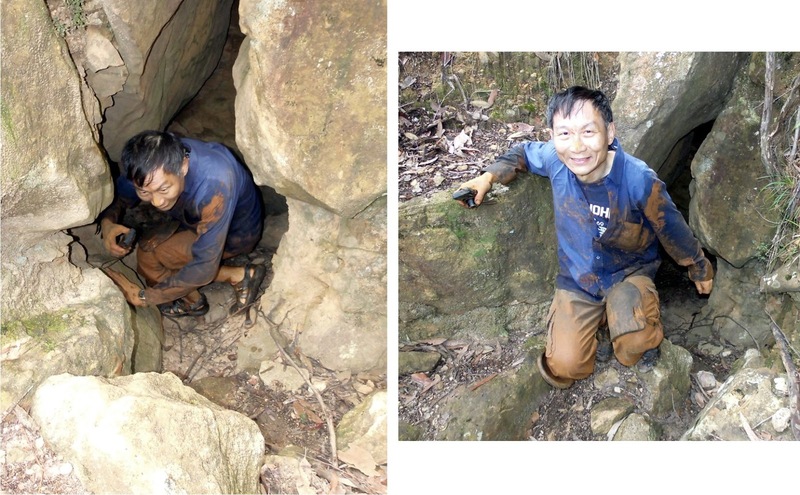 31) We also come to a small rock cliff where there is a chain to help us. Here is me and Nick. 33) We are back at the Rennies Tunnel exit hole. 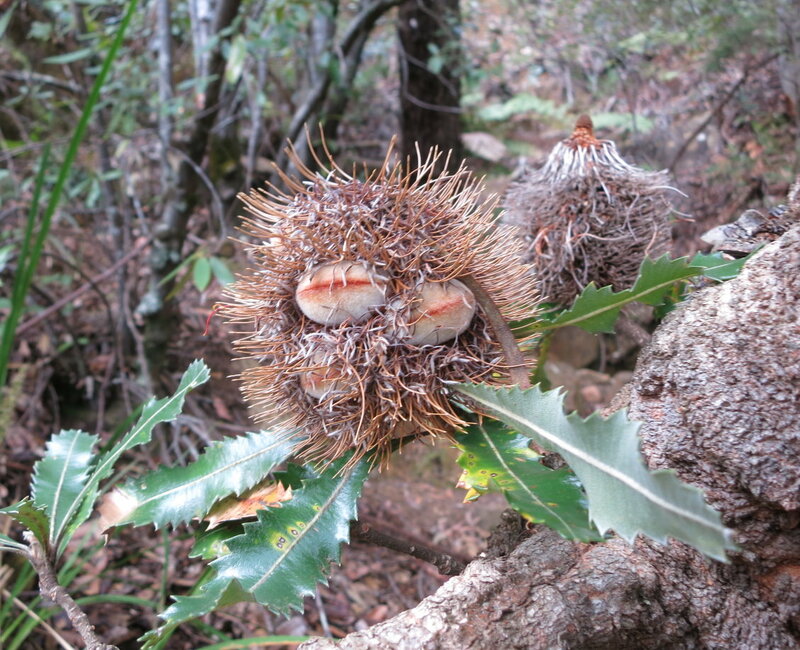 Around here, I snap this photo of a Banksia. 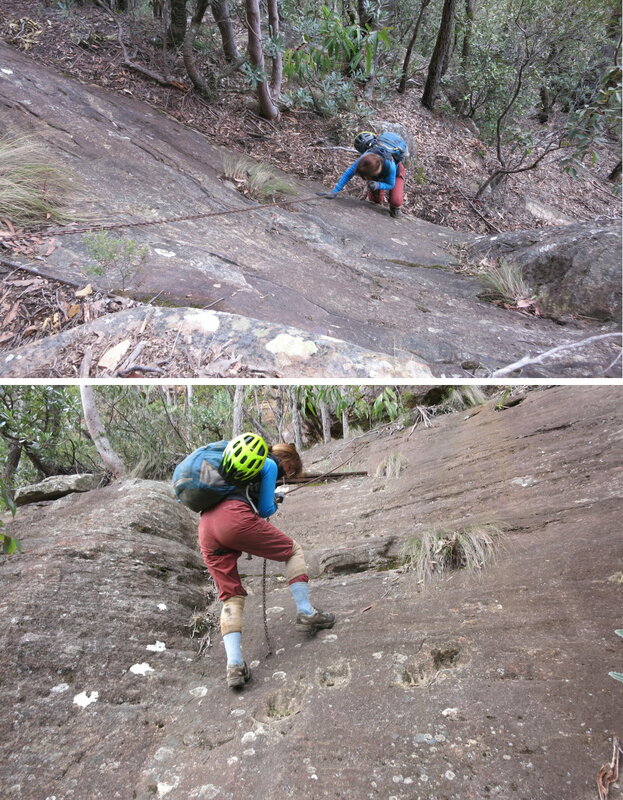 34) We retrace the steps back to the waterfall at Devils Hole Creek, then climb up a nearby steep and narrow pass towards the top of the cliff (to Cliff Drive in Katoomba). 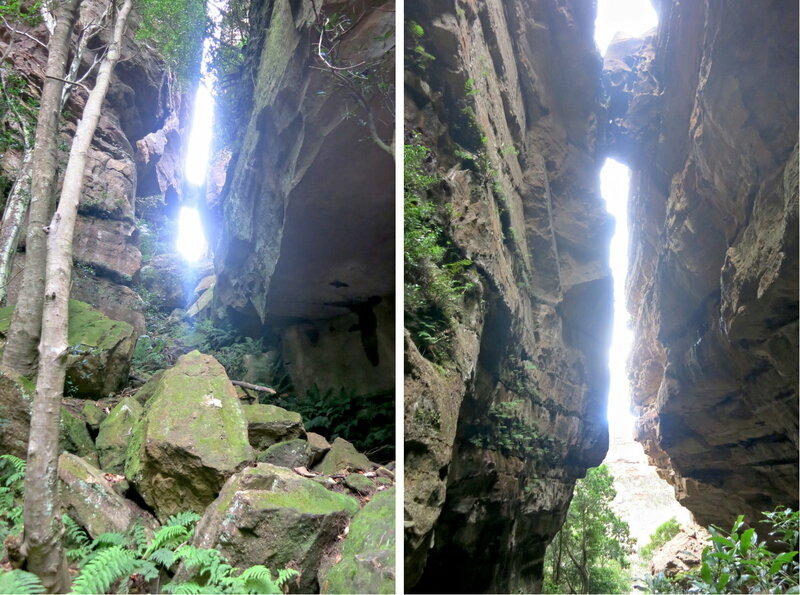 An interesting feature of this pass is we walk under a large chockstone wedged between two vertical cliffs. 36) We are near the top of the pass and looking back at the chockstone. 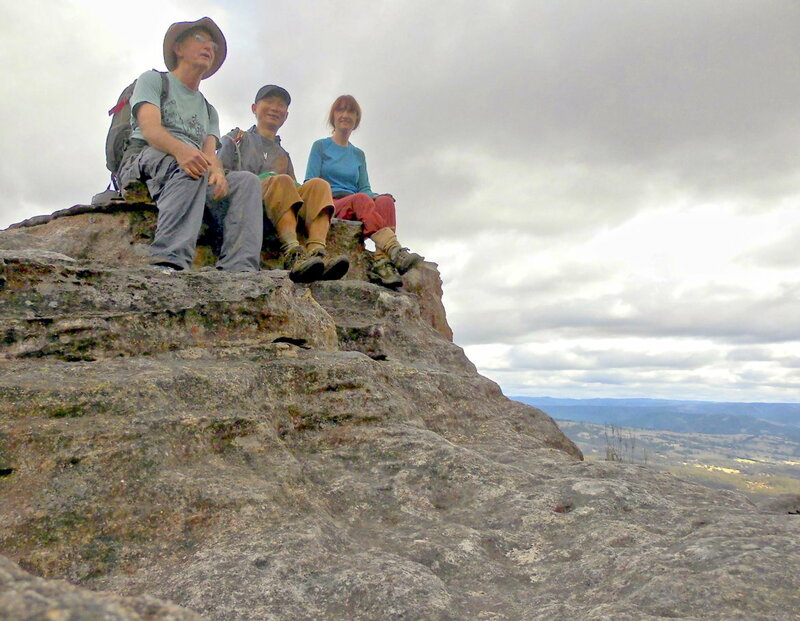 37) After climbing up the pass, we detour towards a lookout which is the rock in front and which is just above the pass. 39) This pagoda like rock is the cliff on the opposite side of the Devils Hole pass of Photo #34 & #36. From where we are standing, we could have climbed down to the top of the chockstone. We didn't do it this time ... but it would be interesting to give it a try ! 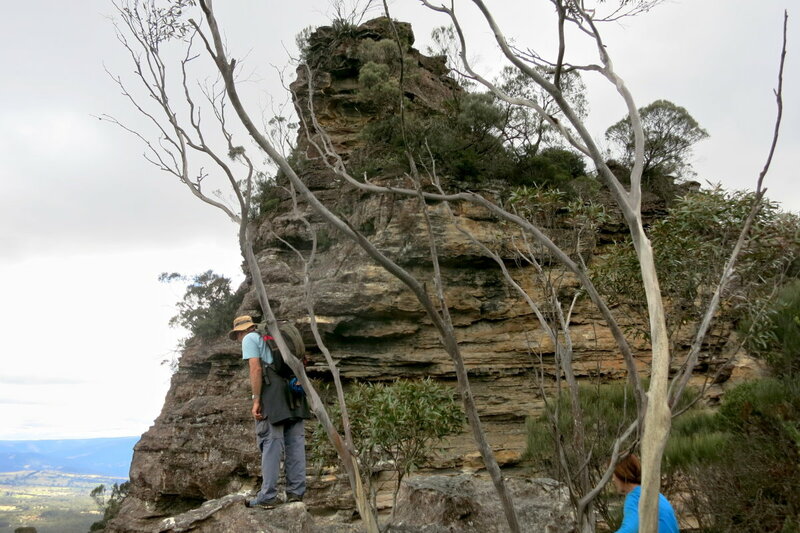 - The entire Narrow Neck plateau is in front of us. Megalong Valley is to the right of the plateau. 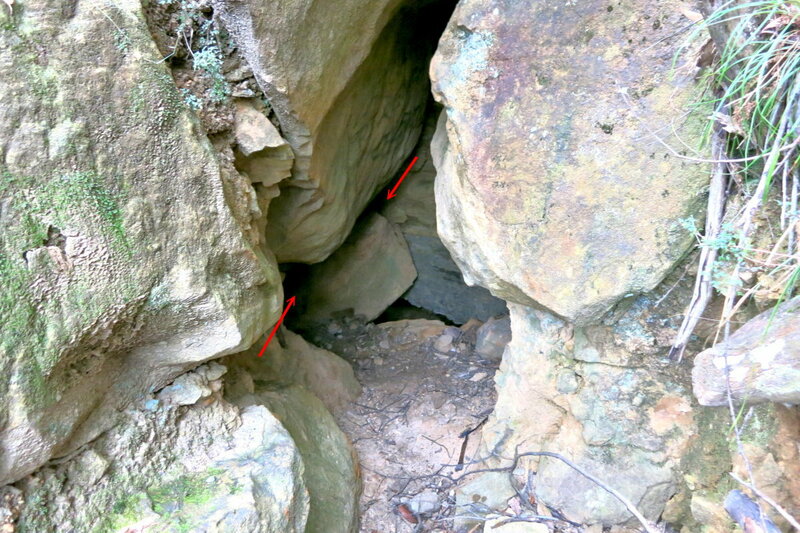 - The red arrow points to where we exit out of the Rennies Tunnel. 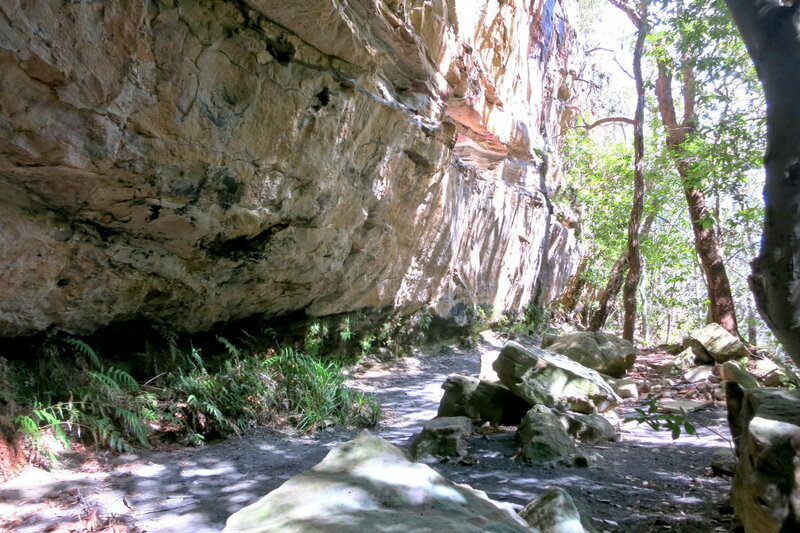 The Tunnel goes under the narrowest part of the Narrow Neck. - The cliff on the right edge of the pic is the pagoda like cliff of the previous photo. - The cliff at the top left hand corner of this pic is the pagoda like cliff in Photo #39. - The rock pointed to by the red arrow is where Nick was standing in Photo #39. After the detour to the lookout, we climb up to Cliff Drive, then walk along it and turn into Glenraphael Drive. 42) On Glenraphael Drive on the Narrow Neck plateau, we detour to Waterboards's Pumping Station. 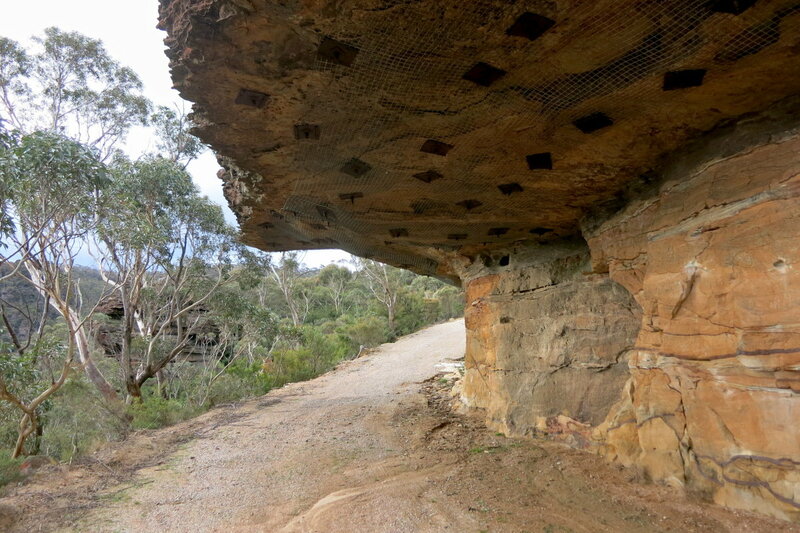 On the access road to the Pumping Station, there is this overhang ... Note the bolts to secure the roof of the overhang. 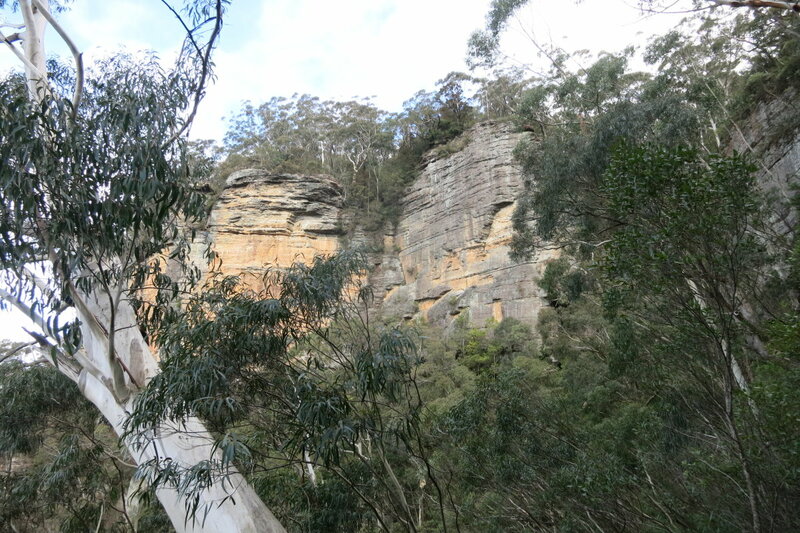 43) We are on the Narrow Neck plateau, and about 250 meters north of Rennies Tunnel ... nice view of the Narrow Neck cliffs. 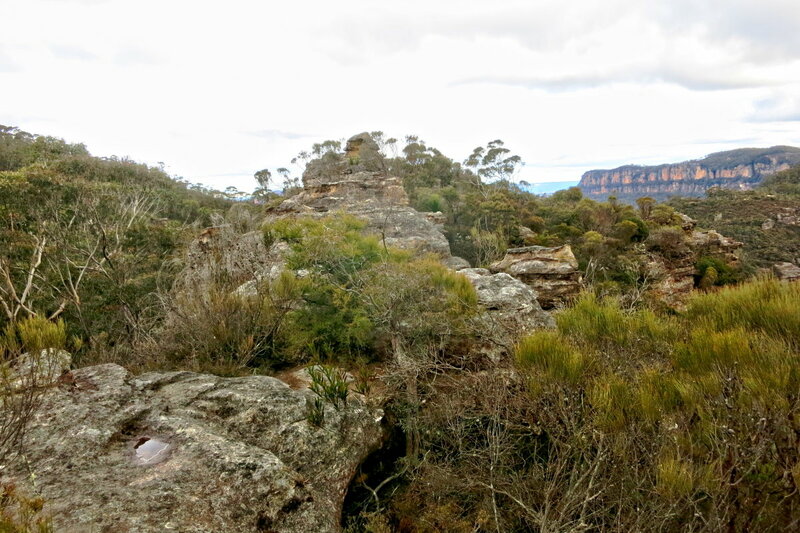 - View of the Narrow Neck plateau (on the left) and Megalong Valley. - Rennies Tunnel exit is pointed to by the red arrow. It is definitely exciting to crawl through it, and you will have an entertaining topic for dinner table conversations afterwards! But it reminds me of a Japanese proverb that goes something like ... you are wise to have done it once, but a fool to want to do it again ! - The water in the tunnel is very cold. Wear socks and shoes. It will keep your feet warmer. - If you intend to crawl, wear knee pads. 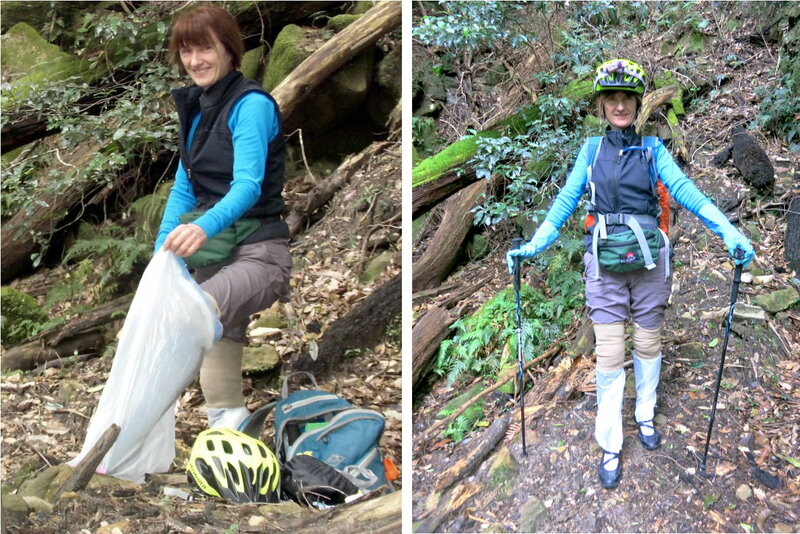 If you intend to crouch-walk, a pair of hiking poles maybe helpful. - Whatever you wear will be stained orange/brown by the ochre mud. The stain cannot be washed away. So wear old clothes, shoes & backpack that you are prepared to throw away. - Be careful when you use your camera. The mud from your hands will be deposited onto the camera and you may not be able to clean the mud out.